Our retreat home for the weekend in the near-mystically beautiful Salcombe, our own Seafolly babe palace, perched on the beach overlooking the crystal green waters of the West Coast. It wasn't hard to imagine that Tennyson was so inspired by this very place that he penned poems such was the inspiration the otherwordly scenery inspired him with. With Seafolly beach vibes in abundance and a brilliant crew of women for the weekend, we tucked into a hearty spread by the Potency Team, a vegetarian menu over the weekend fueling us for our endless hours of fun. Dawn’s golden fingers creeping through our curtains on Saturday, my surf-fitness high intensity class kicked off our first day, introducing the ladies to pop-ups and getting sweaty whilst tesing out the new season Seafolly fitness gear. I love the detail of the products, and radical bright coloured designs. Chowing down some of Potency's award-winning energy balls, we headed beach-way for our stand up paddle boarding adventure. All aboard the SeaFolly Express! 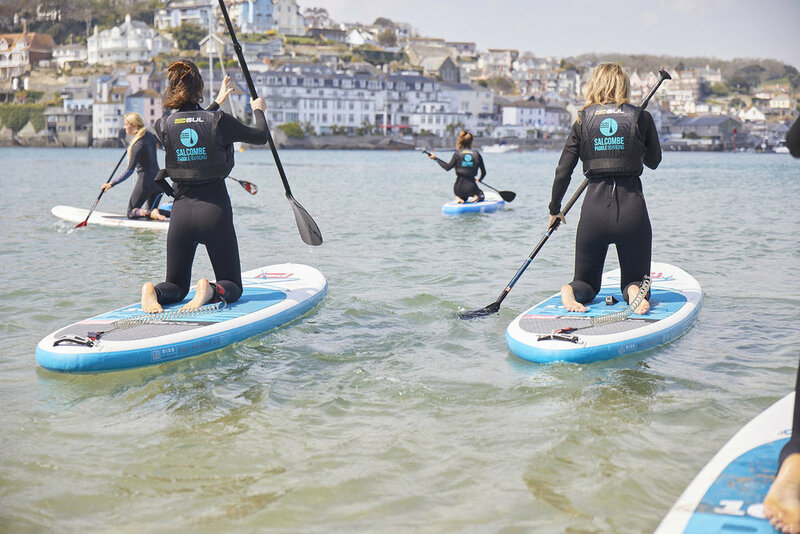 Exploring the beautiful bays and breathtaking waters of the bay with our girl gang was an all-time adventure, the endless smiles, team-ditch into the fresh waters and post-SUP beach play with Gracie the puppy leaving us sun-kissed and stoked. A quick stop of at the local pub The Winking Prawn for fresh grilled prawns slathered in garlic butter and we headed back to our girl-gang abode, ready for a restorative, candle lit stretch. Toasting the day with cocktails courtesy of Potency and a generous feast, a dance-off as we checked out next season collection of Seafolly (it’s off the chart awesome), and we cosied up for a viewing of the all-time classic chicks surfer movie. Yup you guessed it, Blue Crush. Waking up to another blue-bird morning and a generous serving of poached eggs with crisped coconut flakes over rye with avo, we took the workout outdoors, for an energising conditioning session underneath the sunny skies. An incredible weekend with the Seafolly girl gang.